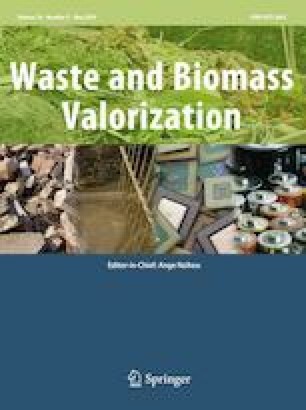 The performance of semi-dry anaerobic co-digestion of corn stover and vegetable waste was investigated using batch reactors and leaching bed reactors (LBRs). Six mixing ratios of corn stover and vegetable waste were employed to investigate optimal methane production using batch reactors, and process stability was assessed using the two LBRs. Kinetic assessment, methane production, volatile solid (VS) reduction, and digestate characteristics were used to evaluate the performance of anaerobic co-digestion. After 50 days of anaerobic co-digestion in the batch reactor, methane yields reached 314.5–323.4 mL/g VS, and increase in methane production rate indicated that synergistic effects occurred during anaerobic co-digestion. The corn stover and vegetable waste with a total solids (TS) ratio of 14:1 yielded the highest methane production efficiency and rate, as well as VS removal efficiency. However, serious acidification at the initial stage of digestion in the LBR experiments suggests that the scaling-up process from batch reactor to LBR was unstable, which may be attributed to high TS concentration and substrate characteristics. This work was supported by Major Science and Technology Program under grant (2014BAK09B03, 2017ZX07603) and Key Project of Anhui University Science Research (KJ2017A160).